I’m finally back with the bonus project for Block 4. Can you even believe it? 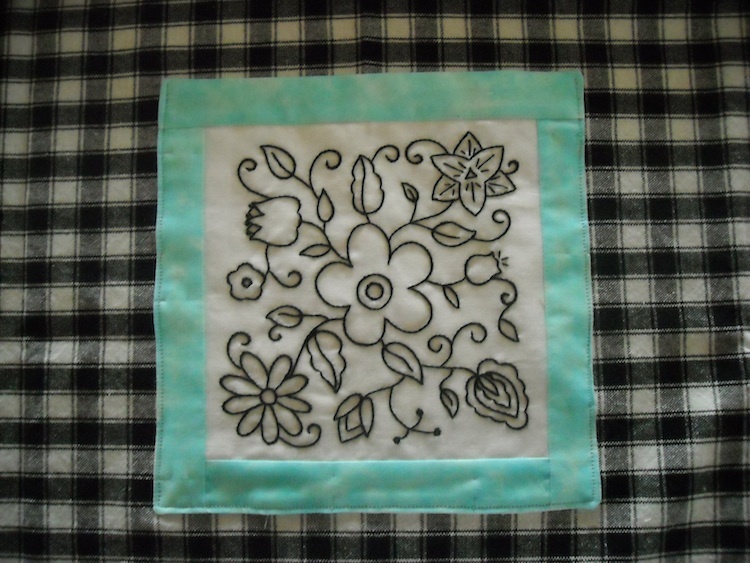 This time, I chose to reduce the size of my embroidered block and use it as a pocket on an apron. An apron made from a tea towel, which only makes it even easier. 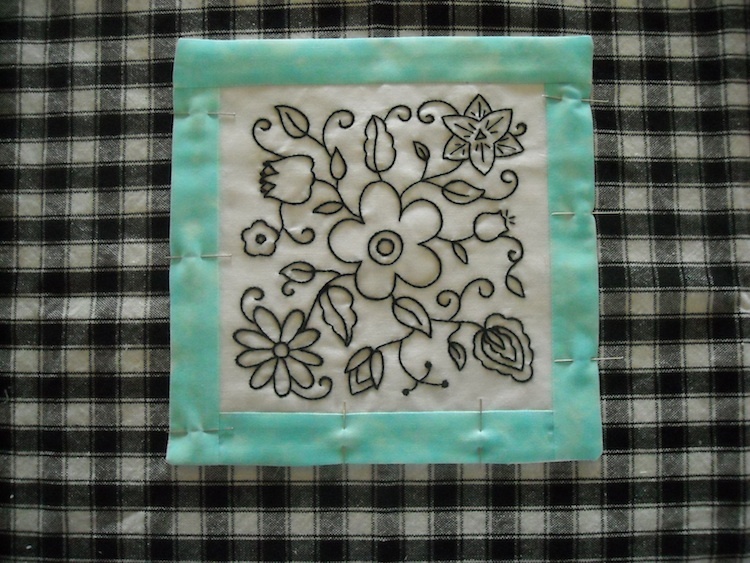 And a finished embroidery block. To make the block the right size, simply reduce the block pattern to 50% of the original size. Trace it onto an 8″ or 10″ background square to do the embroidery. 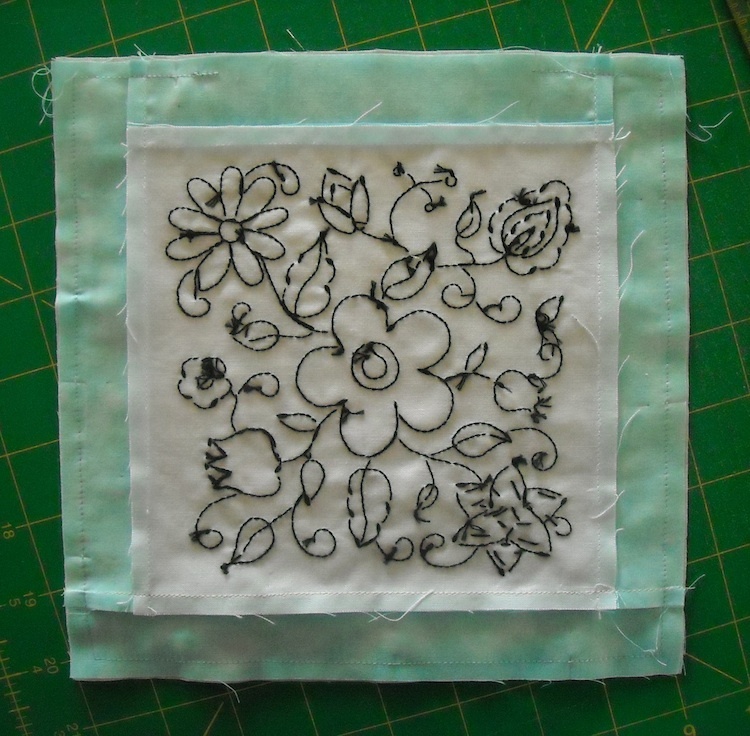 Then trim the finished embroidery piece to 6 1/2″ square instead of the normal 12 1/2″. You can find the pattern for Block 4 HERE. I’m going to outline some of the process here, then send you to another tutorial to finish the apron, just because I already have that tutorial, so it saves me having to re-write everything. First, we’ll prepare and attach the pocket to the apron front. Sew a 6 1/2″ strip to the top of the embroidered block, and one to the bottom. Press seams toward the strips. 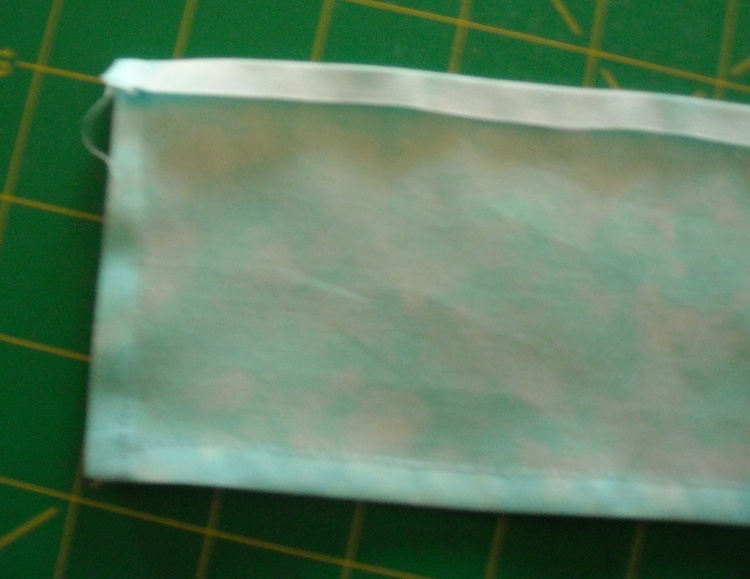 Then sew the 8 1/2″ strips to the sides of the embroidered block, again pressing seams toward the strips. Position the embroidered piece right sides together with the white lining piece, and pin them together. I somehow missed getting pictures of this part, but since it’s fairly straightforward, I know you’ll get it just by looking at the next picture anyway, so forgive me. Let’s move on . 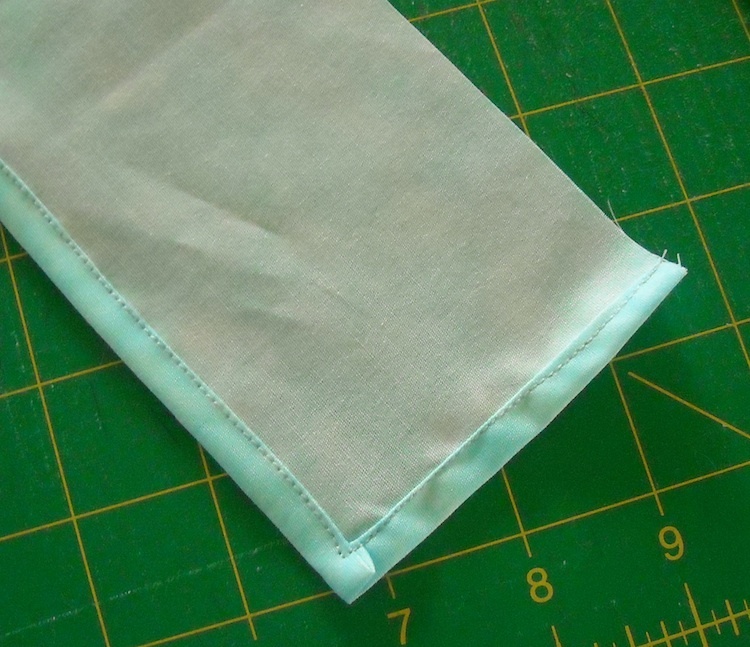 . .
Stitch all the way around the outer edge with a 1/4″ seam, leaving an opening for turning the piece right side out, preferably on the side that will be the bottom of your pocket. Clip the corners and turn the pocket right side out and press. Pin the pocket in place in the center of the apron (or in whichever position you wish your pocket to be). There’s no need to close the hole in the pocket piece, because it will get caught in the seam as you stitch the pocket to the apron front. 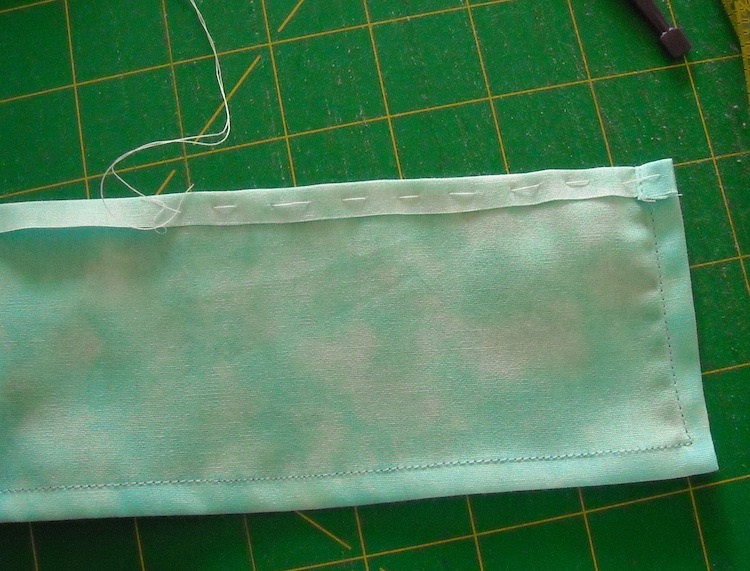 Topstitch around the side and bottom edges of the pocket to attach it to the apron. Next, we’ll add the ruffle to the bottom. 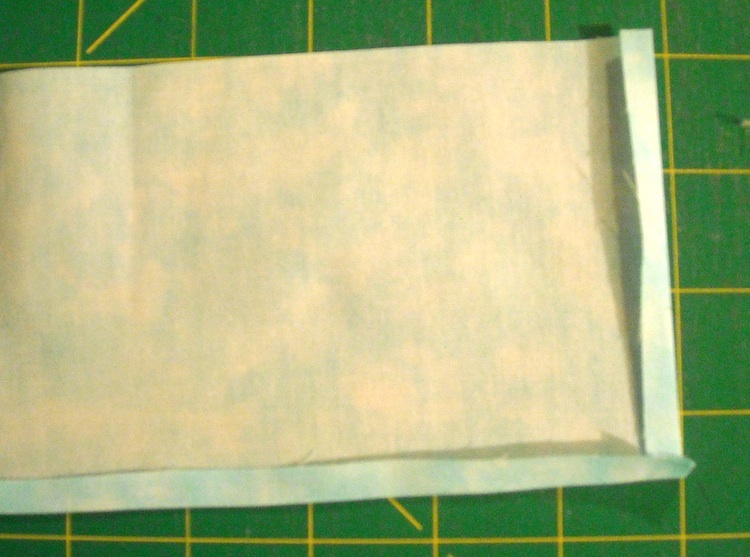 From your coordinating fabric, cut a strip 4″ x width of fabric (WOF). Press under 1/4″ on the two short sides and one long side. Turn under again and topstitch the fold to hem the ruffle piece. 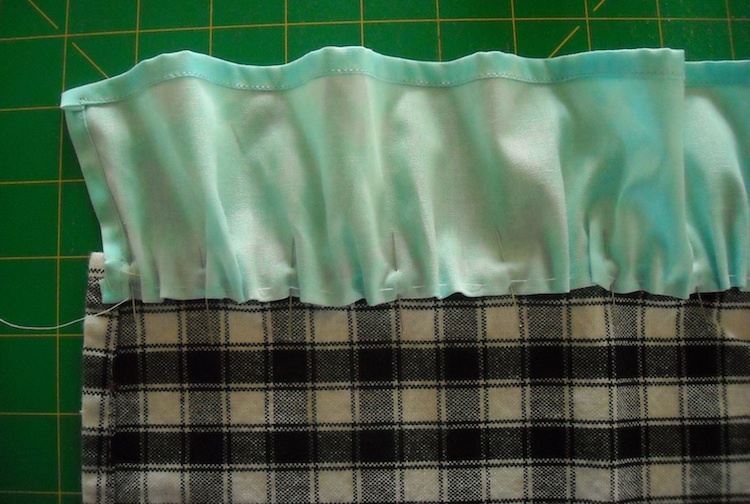 Next, turn the top raw edge of the ruffle down, right sides together, 1/4″, and press. Using strong thread, and a large running stitch by hand, sew a line of loose stitches across the top edge through both layers. This will be your pull string for the gathers. Find the center point of the ruffle piece and mark it with a pin. 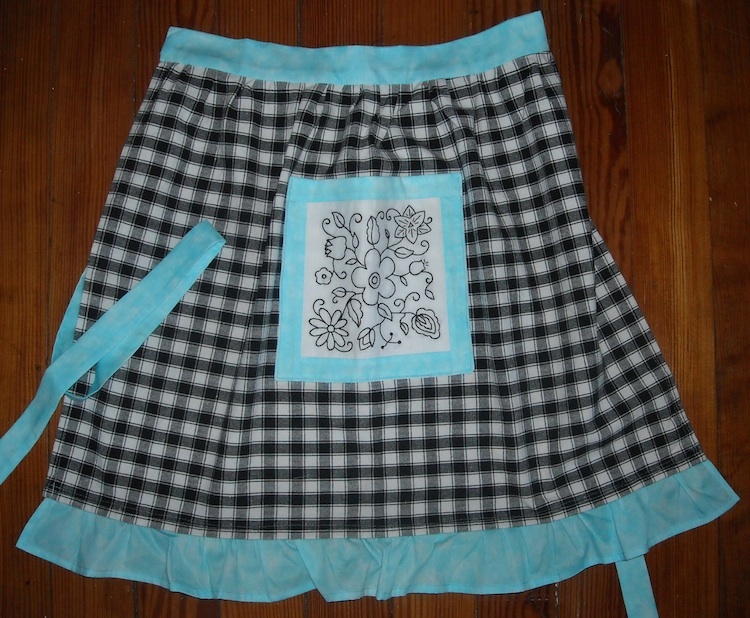 Find the center point of the apron bottom and mark it with a pin. 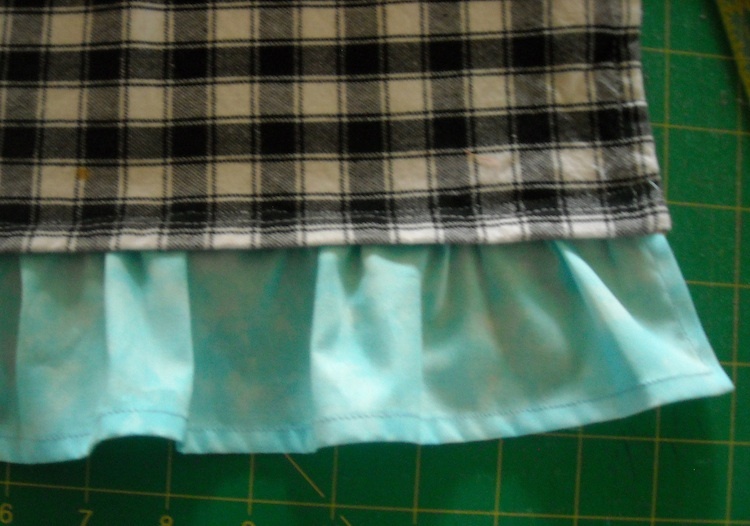 Place the apron right side down on your work surface, and place the ruffle piece right side down on top of it, overlapping the top edge of the ruffle with the hemmed edge of the towel. (Both wrong sides will be UP.) Pin the center points together. Pin the ruffle piece in place at each end of the apron front. Now use the pull string to gather the ruffle to fit the apron front, working with one half at a time. Pin the gathers in place. Stitch along the folded edge of the ruffle to attach it to the apron front. Now you have your apron front ready to finish. Click HERE to go to the tutorial for the instructions on making and attaching the ties strings and waistband. And that should finish up your apron. I’ll be back in a few days with Block 5. I know I’ve been lax about posting the blocks for this quilt-along, but since they’re so involved, several of you have said it’s given you time to catch up and keep up. However, I’d like to wrap the whole thing up pretty soon, because there are some other exciting things coming along for the diary project, so stay tuned! oh, darling. This is an apron that I have to do……..gotta go get a tea towel……. And I still haven’t quite finished block 4 embroidery so I am okay with a slowooow project. As if all my projects aren’t slow.